Perk up your ears! Improve your Intonation by Ear! Ingenious and Simple! Are you already listening or are you still looking? Intonation Training by Ear! The INTUNATOR is an innovative, new training aid to assist in the development of correct intonation for all wind and string instruments. 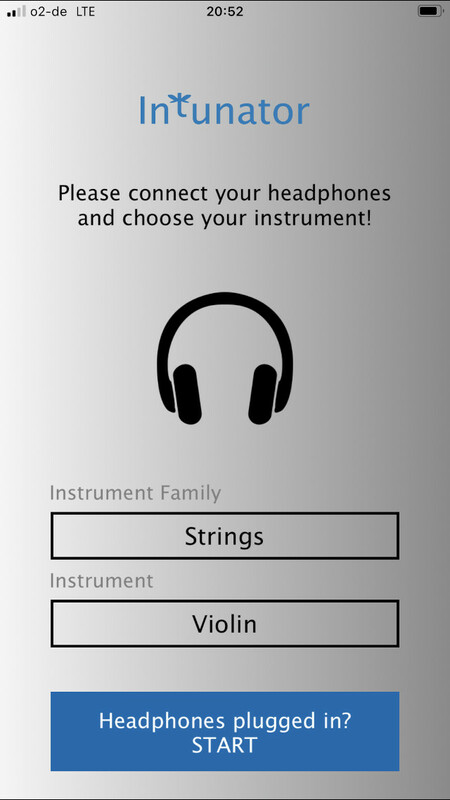 The App recognizes the note being played and plays it back with the correct intonation through the user's headphones. While you are practicing, you will intuitively match the note you are playing to the note you are hearing. You are literally training your intonation by ear as you play. INTUNATOR always gives you the right note, whether it's a single note or an entire piece of music! INTUNATOR immedately and accurately recognizes the note played over a range of nearly 7 octaves. 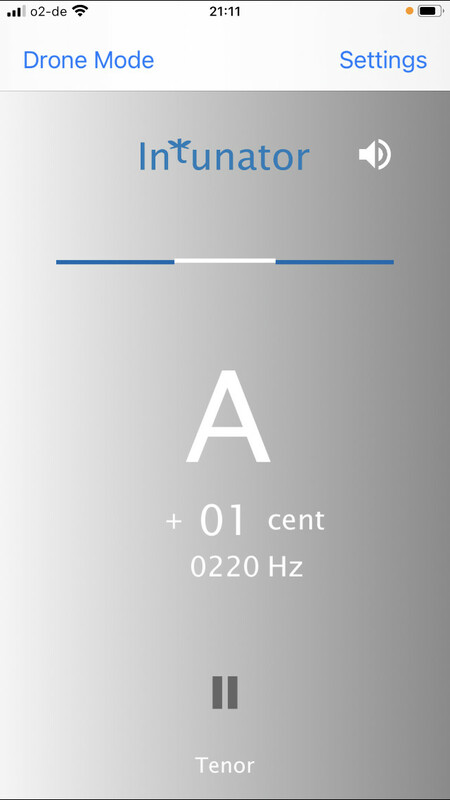 The recognized pitch is corrected according to the tempered scale and played back as long as desired into the headphones being worn by the user. Three special sounds were developed specifically for this purpose. These, in addition to the volume control on your mobile device allow you to create the optimal balance between your instrument and the tone being played back by the INTUNATOR. The note names are shown on the Display. An easy to understand graphic supports the user's intonation control. The note names are shown in their transposed form. An automatic User's Assistant is there to ensure a quick and easy application of the App for the user from day one. There are various possible settings: Choice of Instrument, Transposition, Concert Pitch, Volume of Background Noise, Display of Frequency and Deviations in Cents, Notation Preferences in either sharp or flat, Audio Output Sound, and the Pitch Detection Number, which is determined by the instrument being used. The INTUNATOR can be used as a reliable tuner over a range of nearly 7 octaves. Connect your headphones with no built in microphone. Tune your instrument with the note you usually use. Check and, if necessary, correct the volume of your headphones. 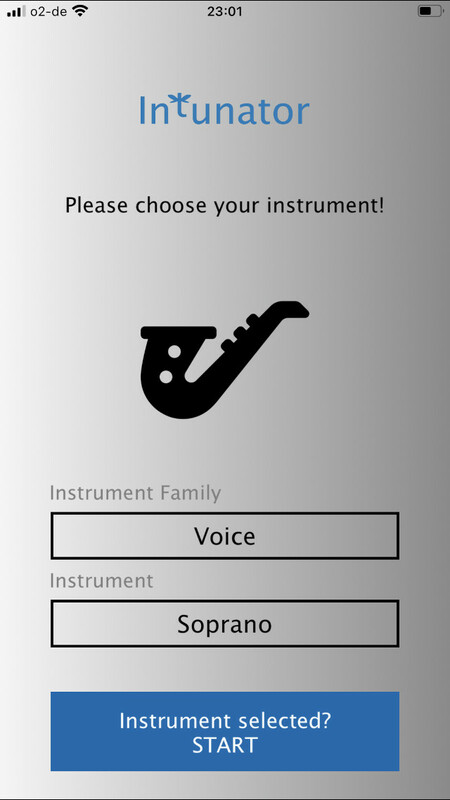 Now you can play what you'd like on your instrument. The INTUNATOR will always accompany you with the "right note". Improve your intonation by matching the sound you hear in your headphones to the one you are playing on your instrument. The app's visual display will help you with this. Over time, you should slowly try to wean yourself off of the visual aid and use your ears more and more to help you improve your intonation. Learn the intonation quirks of your instrument! Correct your intonation intuitively. Enjoy exerting control over your instrument. Create an intonation profile for your instrument (see PFD-Download). With it, you will get a clear overview of the concert pitch of your instrument. This knowledge will make your work with the INTUNATOR easier and support you on your journey to better intonation. The creator of the App explains how INTUNATOR works and demonstrates how it works using an alto saxophone. Markus Rombach holds degrees in music theory and saxophone performance. 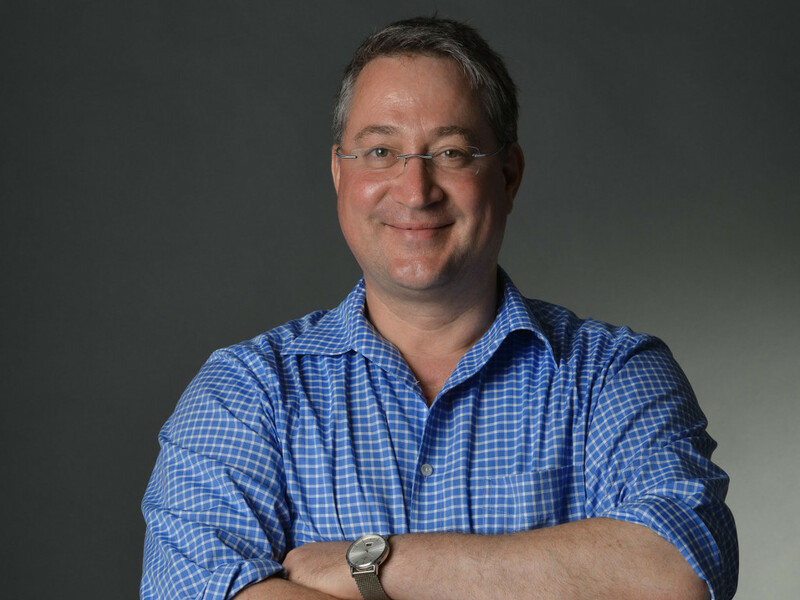 He teaches aural training and solfege at the Conservatories of Music in Freiburg and Karlsruhe, Germany. He is also a professional saxophone player. MARO Software was founded by me in October 2014 in order to facilitate the creation of this app. As a teacher of aural training and a saxophone player, my mind has been occupied by the topic of intonation for as long as I can remember. Intonation is the art of playing music at exactly the right pitch. The ability to play IN TUNE with other musicians is one of the most essential basics of music making and is able to be learned by all. However, up until now, there has not been a technical aid capable of helping musicians practice and improve their intonation. The ubiquitous tuner offers musicians a visual aid toward improving their intonation. It is, however, very static and fails to support musicians' elementary control of their ear. I thought to myself: "There must be a way to train and improve intonation using your Ear." I found the obvious solution in the development of an app for smartphones. It's inexpensive, accessible at all times and able to be used universally. It is simple to use. The idea for this App emerged in 2013. After more than two years of planning and development, it's finally finished! Now available, in the Summer of 2015. In particular, I would like to thank the development company Remolution Software GmbH for their productive assistance on this project. It has been a pleasure working with you! The INTUNATOR gives all musicians the chance to work on improving their intonation on their own, at their leisure. Whenever they have time, they can practice and improve their intonation on their individual instruments without any outside pressures. Just play what you want, without any pre-set requirements being placed upon you from the outside. You just have to perk up your ears and allow yourself to be led by the notes being played in your headphones. It is my wish that the INTUNATOR helps many musicians on the path to better intunation, thereby increasing the amount of pleasure they have when playing music. Let the INTUNATOR help you to learn how to improve intonation on your instrument! Our method teaches all musicians how to improve their intonation in the most obvious way: By using their ears! Practice independently and without outside help. Our App is waiting for you in the store! Which headphones work best with the INTUNATOR? Generally speaking, you can work with all types of headphones. However, please do not use INTUNATOR with headsets that have a built in microphone. It will not work properly. The best type of headphone is a so-called "open headphone". In this way, you can hear your instrument directly in your ear, and hear how it mixes with the sound being played by the INTUNATOR device. In some circumstances it makes sense to leave one ear free of headphones. A long cable is ideal so that you have a comfortable amount of movment while playing. A tip: If you adjust the Background Noise on the app to the very soft setting, you can even put your cell phone into your pants or shirt pocket. The sounds will still be recognized and you can move around freely. With wireless headphones, analog models are recommended. Digital wireless headphones and those using Bluetooth technology have unpleasantly long lag times when used with the INTUNATOR App. Is it possible to use the INTUNATOR without headphones? In order to improve your intonation while using INTUNATOR, the use of headphones is essential. However, you can use the INTUNATOR without headphones as a visual tuning aid. It is accurate for a range of almost 7 octaves. You must turn off the volume on the cell phone, because otherwise it will record its own sound, which can cause it to become hung up on a particular sound. We recommend against using your cell phone's speakers with the INTUNATOR app for this reason. Can I practice my singing with the INTUNATOR? Yes and no. The INTUNATOR was developed primarily for use in training and improving intonation for string and wind instruments. This version of the INTUNATOR is not designed for use in practicing intonation of the human voice with your ear. However, you can use the App while singing as a good visual control. Mute the sound on your smart phone and choose a non-transposing instrument with the appropriate range. Women, for example, could use the viola and men could use the cello. The INTUNATOR will show you every note that you sing by name, including any deviations you may make with your voice. A version of this app specifically designed for use with the human voice is currently in the planning stages. Can I also use the INTUNATOR to improve my intonation using the just scale? Unfortunately not. The INTUNATOR is only able to play back sounds using the tempered scale, which allows it to be used freely, i.e. independent of tonic and keys. The development team is already working on a more advanced version which would allow other types of tuning systems, including the just scale. Why is the note that being played in the headphones sometimes an octave higher than the one I am playing? The pitch detection algorithm of the INTUNATOR was perfected so that it recognizes and re-plays the note at the proper pitch for all instruments over a range of nearly seven octaves. However, sometimes overtones of the pitch being played affect the ability of the INTUNATOR to correctly recognize the note. This results in the octave playing louder than the actual note being played. In these rare circumstances, the octave is played rather than the desired note. Consider the resulting intonation exercise with the octave as an additional training method on your path toward perfect intonation. How does the background noise setting work? The recommended default setting is normal background noise. The quieter the setting, the more sounds and external noises will be picked up by INTUNATOR. At higher settings, less signals are picked up and recorded by INTUNATOR. If you want to carry your mobile device on your person while using the App (in your pants or shirt pocket, for example), choose a quiet setting so that it can pick up as much sound as possible. If there is a lot of background noise, please choose either the loud or very loud setting. What does the default setting of 442 Hertz mean and what happens when changes are made to this setting? In order to play together with other musicians or in a "Play Along" scenario, it is necessary to use the same concert pitch for all instruments. This concert pitch is determined by the so-called standard pitch "A", which generally lies between 440 and 444 Hertz. The standard pitch frequency determines the relationship of all the other notes to each other as well. Most orchestras these days tune to at least 442 Hertz, which is why we have chosen that as our default setting for the App. What information does the INTUNATOR's display setting give the user? The notes being played are displayed by name. In addition, all possible transpositions of notes are given in the Choice of Instruments, for example B-flat for trumpet or E-flat for alto saxophone. Deviations from the desired pitch are shown graphically with a white line. Additionally, you can also choose to have the Display show the exact number of cents deviation. You may also choose to activate an option which allows you to show the exact frequency played in Hertz. How does the pitch detection number work? The complex pitch detection settings of the App are optimized so that all notes can be recognized for every instrument. This is particularly important for lower pitched notes. Every instrument is assigned an individual pitch detection number according to its pitch range. If for some reason the lowest notes on your instrument are not being recognized, please choose a smaller pitch detection in your instrument settings. What operating system does my handheld device require in order to be able to run the APP? To what extent can INTUNATOR keep up with me when I play quickly? Is it possible to test the App free of charge? Unfortunately the three platforms being used to bring the INTUNATOR to consumers, namely Android, Windows and iOS, do not uniformly offer the option of testing the complete version of the program at this time. We wish that were possible. We don't believe that a limited version of INTUNATOR would make any sense and therefore are not offering one. For reasons of fairness, we have decided to exclusively offer the full version, which must be purchased. What influence does the default setting have on the "Assistant"? There are two settings that are automatically chosen with the help of the App's "Assistant": the transposition of the notes and the optimal pitch detection number for every instrument. 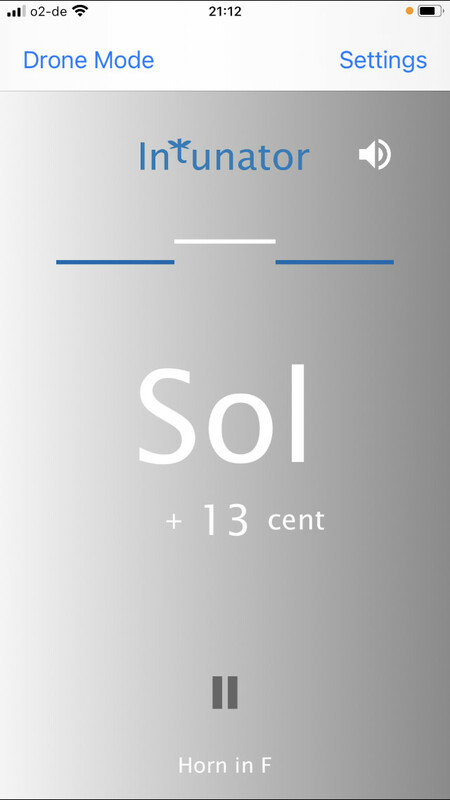 The pitch detection number guarantees the recognition of pitch for the entire spectrum of sound for the selected instrument.